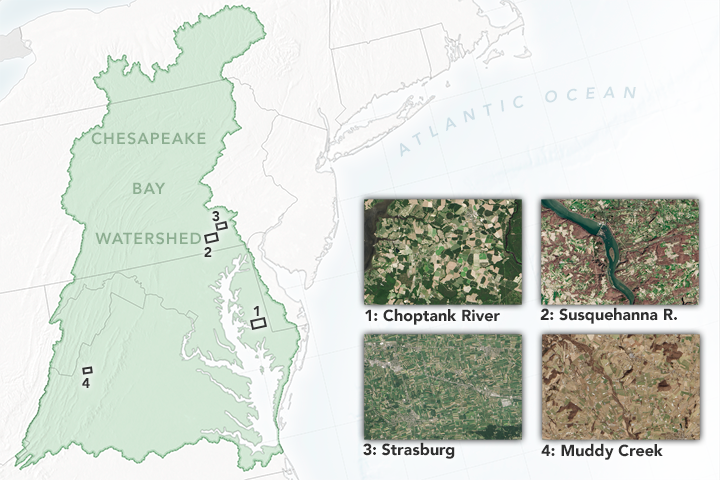 People who track water quality issues in the Chesapeake Bay are accustomed to bad news. But lately some glimmers of hope have begun to emerge amidst the polluted streams, dead zones, fish kills, and algae blooms. In April 2016, the University of Maryland Center for Environmental Sciences published its annual Chesapeake Bay report card and found clearer water, lower levels of algae, and a resurgence of sea grasses. In the same month, the Maryland Department of Environment announced that it had mapped 53,000 acres of submerged aquatic vegetation—a record amount and a clear sign of the ecosystem’s improving health. In July 2016, the Maryland Department of Natural Resources reported that the size of the dead zone in the Bay in late June was the second smallest since 1985. Other data sets also show progress. U.S. Geological Survey measurements of water quality in several rivers that flow into the Bay show improvements over the previous three decades. And the late-summer dead zone in the Bay seems to be shrinking, even as the early-summer dead zone remains stubbornly large. The Chesapeake Bay Program—a unique regional partnership involving state and federal governments, academia, nonprofits, and the private sector—has been measuring the improvements. In April 2016, the group announced that the amount of three closely-watched pollutants has dropped. Since 2009, inputs of nitrogen entering the Bay declined by 8 percent, sediment by 7 percent, and phosphorus by 20 percent. The reasons for the declines are numerous, complex, and not fully understood. However, water quality experts point to a few likely explanations: less nitrogen is raining down from the atmosphere into the Bay because of improving air quality in the eastern United States; cities and towns have improved their handling of wastewater; and farmers have increasingly adopted practices that reduce the polluted runoff that enters waterways. Neither nitrogen, phosphorus, nor sediment are problematic in modest amounts, but they cause water quality problems in high concentrations. Nitrogen and phosphorus fuel algal blooms that can deplete levels of oxygen in the water—a phenomenon known as a “dead zone” that can stress and even suffocate fish and other aquatic animals. Suspended sediment, when too abundant, blocks light from reaching underwater grasses, which are key to the Bay’s aquatic ecosystems. It also smothers grasses directly as it settles. 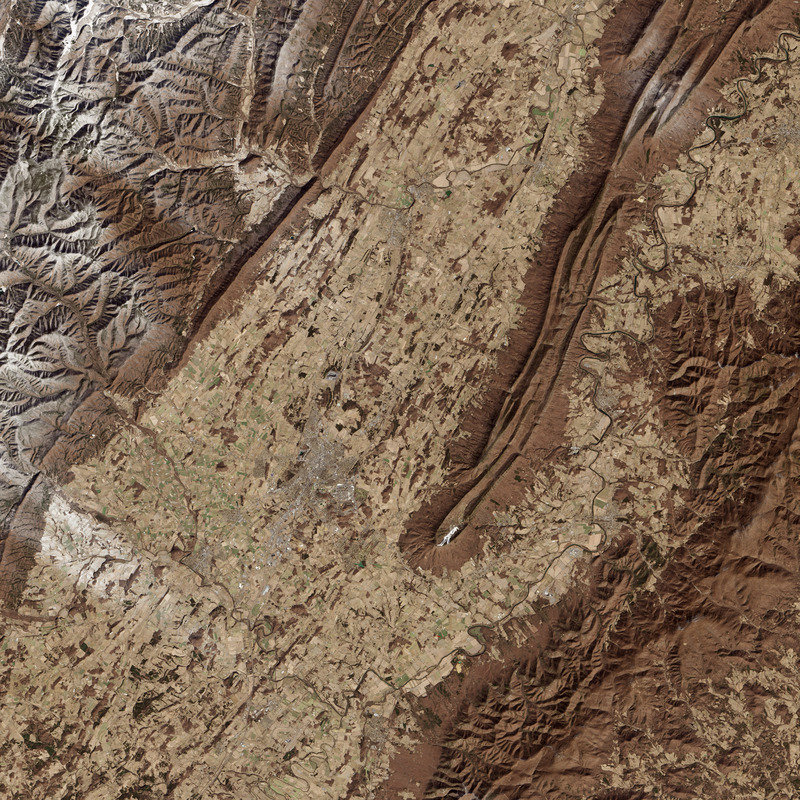 The satellite images on this page were captured by the Operational Land Imager (OLI) on Landsat 8. 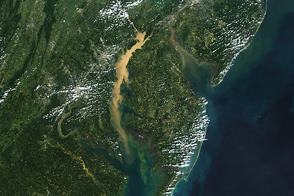 The images highlight farmland in three regions that are major sources of sediment, nitrogen, and phosphorous pollution: the Eastern Shore of Maryland, southeastern Pennsylvania, and the Shenandoah Valley in Virginia. Many factors determine whether (and how much) a given acre of farmland will pollute the Bay. 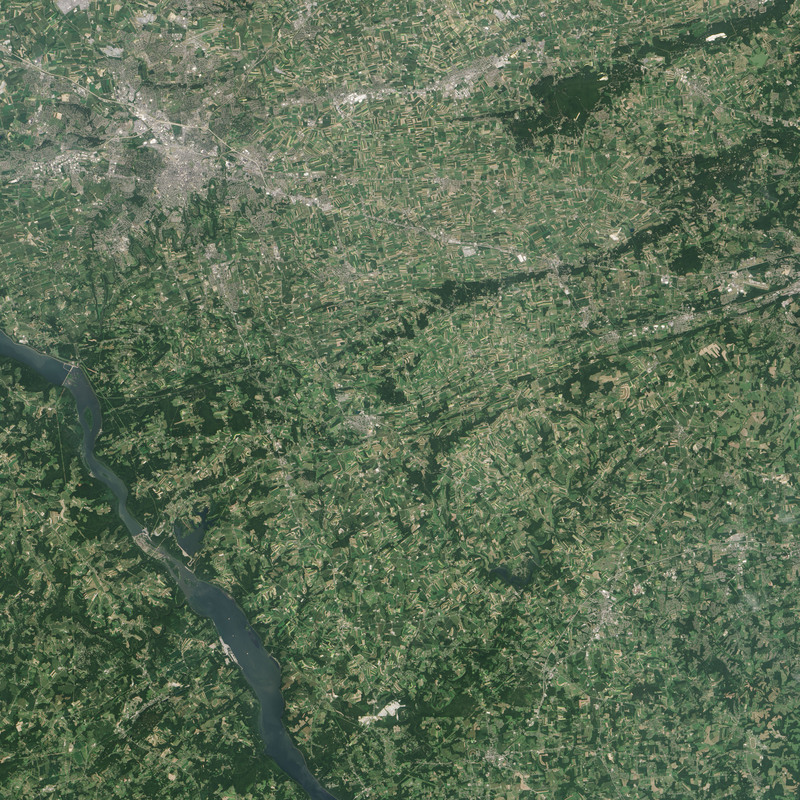 Some factors—such as the over-fertilizing of crops or the installation of fencing around streams—are not easily visible to Landsat 8. Others—such as the planting of winter cover crops or the establishment of forest buffers—transform the landscape on a scale that is quite clear to satellites. 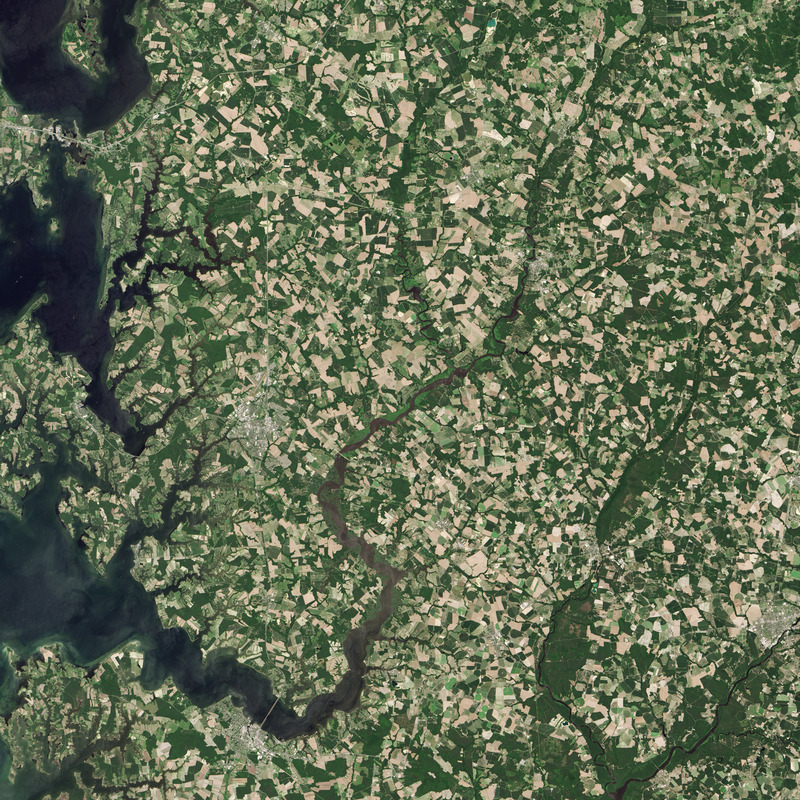 The first image shows farmland on Maryland’s Eastern Shore along the Choptank River. This area east of Cambridge is part of the watershed that saw the most improvement in the University of Maryland’s report card on Bay health. This image and the second and third images highlight a few of the best management practices that some farmers in Lancaster County are using to limit runoff pollution from their farms. And the final image shows a stream in the Shenandoah Valley that is considerably cleaner than it was a few decades ago, thanks to a concerted effort by farmers and homeowners. 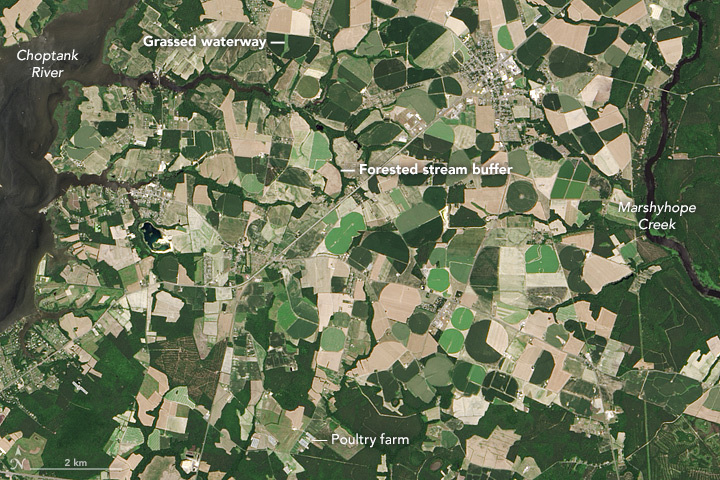 In the Choptank image, notice the cluster of long, rectangular barns, which likely house tens of thousands of chickens. The Eastern Shore of Maryland is home to a booming chicken industry dominated by large-scale growers. Historically, growers in this area added large quantities of chicken litter (a combination of manure and bedding) to the soil, as well as other fertilizers. Though the amount of chicken litter being added to these soils has declined dramatically due to recent environmental regulations, phosphorus levels remain stubbornly high because the nutrients linger in the soil and move slowly through the watershed. Notice, too, how many of the streams are lined with dark-green forest buffers. Such buffers can significantly reduce how much nitrogen, phosphorus, and sediment flows from farms into waterways, particularly if the pollution is flowing in surface water rather than groundwater. Forest buffers also stabilize stream banks and help keep stream water temperatures cool, which helps keep the water clean. Grassed waterways, a few of which are visible in the image, are a similar method that farmers can use to minimize how much pollution flows off the fields and into streams. 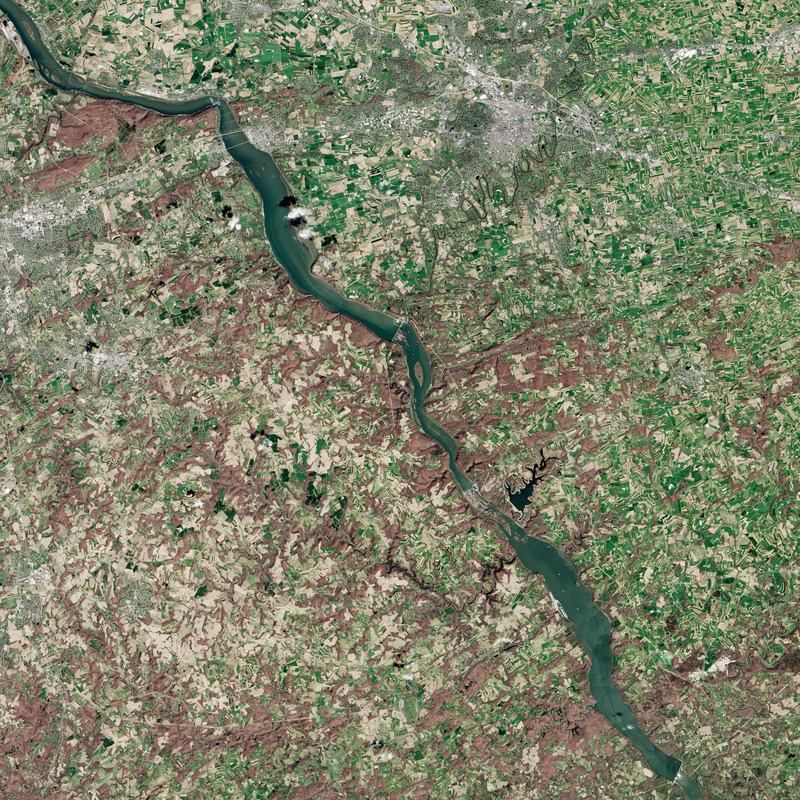 The two middle images show farmland in southeastern Pennsylvania. Since this area has fewer poultry farms but more small-scale farms with cows and cattle, farm runoff tends to be particularly rich in nitrogen. The area is also home to a considerable number of Amish and Mennonite farmers who use traditional farming techniques that can lead to intensive runoff. Many “plain sect” farmers, for instance, do not have systems in place for storing manure or keeping livestock out of streams. One of the more visible management practices in this area is contour plowing, a tilling and planting pattern in which farmers follow the natural contours of the land rather than using straight rows. Contouring minimizes erosion by causing water to pool in small terraces, rather than flowing rapidly down hillsides. 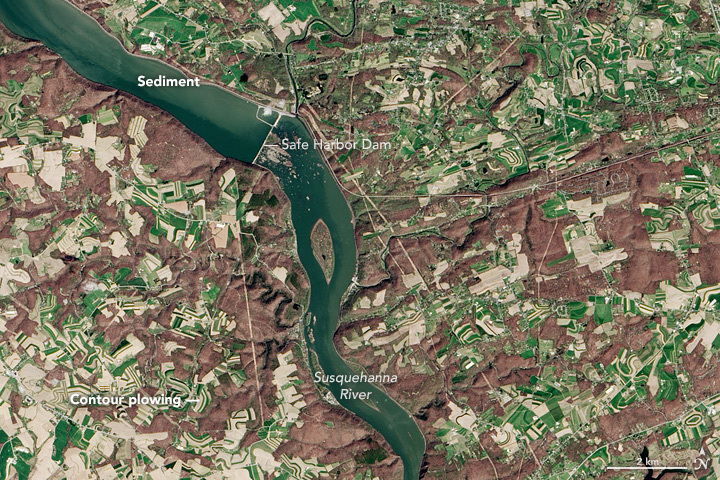 Note that the varied and rugged topography along the Susquehanna makes contour plowing common near the river’s banks. A similar technique, strip cropping, is more noticeable as you move farther inland. By alternating narrow strips of different crops, farmers create terraces that slow erosion and trap storm water. Strip cropping appears to be quite common around Strasburg, Pennsylvania, an area of intensive livestock production. Strip-cropped fields generally alternate an erosion-prone crop (like corn or soybeans) between erosion-resistant cover crops (like hay). A key piece of the water quality puzzle in southeastern Pennsylvania is the series of dams along the Lower Susquehanna River. The Holtwood Dam, built in 1910, initially prevented large amounts of sediment and phosphorus from flowing down the river and entering the Bay. However, research by U.S. Geological Survey scientists suggests that the reservoirs behind Holtwood and the larger Conowingo Dam to the south have filled to capacity. This means increasing loads of sediment and phosphorus will likely begin to flow over the dams after storms, adding large pulses of pollution to the Bay. 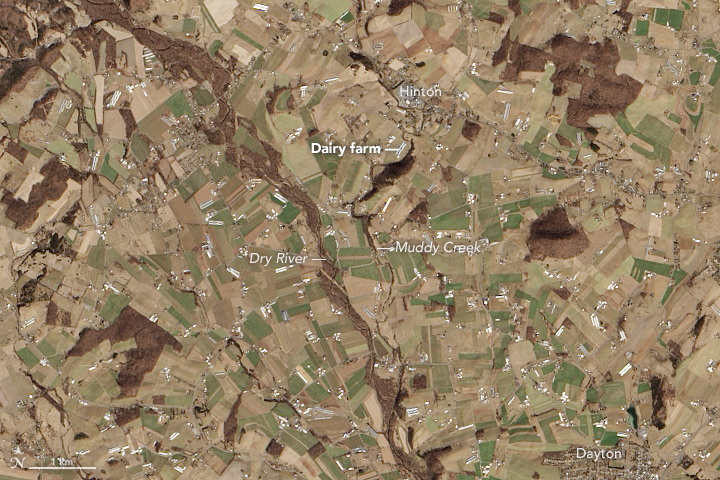 The last satellite image shows farmland in the Shenandoah Valley near Muddy Creek and Dry River. The Environmental Protection Agency listed Muddy Creek as an “impaired”river in 1998 due to pollution running off from farms and leaking from septic systems. Local farmers and agencies began installing fencing to keep livestock out of rivers, building buffers along streams, installing facilities to manage manure, and improving their tilling practices. By 2010, the creek was removed from the impaired list. While efforts to minimize pollution from agriculture have started to pay dividends, plenty of work remains before the Bay will get a clean bill of health. Indeed, despite the improvements, the 2015 report on the Bay’s health gave the water a “C” grade. 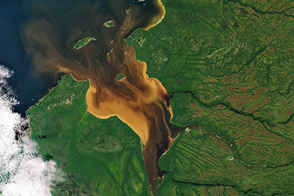 And for many of the most important rivers, manure and fertilizer remain the sources of half of all the nitrogen and phosphorus that drain into the Bay. Editor’s Note: This is the second story in a four-part series exploring the natural splendor and environmental issues of the Chesapeake Bay Watershed. Read part one here. NASA Earth Observatory image by Jesse Allen, using Landsat data from the U.S. Geological Survey. NASA Earth Observatory map by Joshua Stevens. Caption by Adam Voiland. With input from Mark Dubin (Chesapeake Bay Program) and Jason Scott (Scott’s Seeds). While farms remains a major source of Bay pollution, signs of improvements are beginning to emerge. Ator, S.W., and Denver, J.M. (2015, June) Understanding nutrients in the Chesapeake Bay watershed and implications for management and restoration—The Eastern Shore. U.S. Geological Survey Circular, 1406, 72. 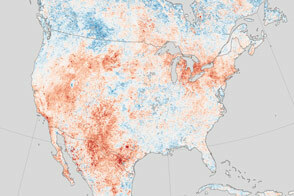 Bay Journal (2010, January 1) Landsat images offer clearer picture of changes in watershed. Accessed August 3, 2016. Brackbill, J. et al (2015) Science Summary—Sources, Fate, and Transport of Nitrogen and Phosphorus in the Chesapeake Bay Watershed—Interpretations and Applications of Spatially Referenced Regression on Watershed Attributes (SPARROW) Nutrient Model Results. Accessed August 3, 2016. Chesapeake Bay Program (2016, April 18) Data Show Drop in Nitrogen, Phosphorus, Sediment Pollution to Chesapeake Bay. Accessed August 3, 2016. Chesapeake Bay Program (2011) What are the Main Sources of Pollution to the Bay? Accessed August 3, 2016. Chesapeake Bay Program (2011) Agriculture. Accessed August 3, 2016. Langland, M.J. (2015) Sediment transport and capacity change in three reservoirs, Lower Susquehanna River Basin, Pennsylvania and Maryland, 1900—2012. U.S. Geological Survey Open-File Report , 2014–1235, 18. 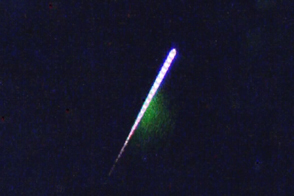 Kobell, R. et al. 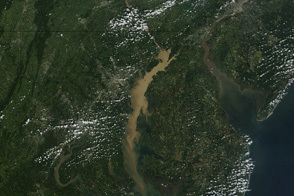 (2015) The Chesapeake Bay and Agricultural Pollution: The Problem, Possible Solutions, and the Need for Verification. Accessed August 3, 2016. Maryland Department of the Environment (2016, April 28) 53,000 Acres of Submerged Aquatic Vegetation Mapped in Maryland. Accessed April 28, 2016. University of Maryland Center for Environmental Science (2015, April 28) Chesapeake Bay health improves in 2015. United States Environmental Protection Agency (2012, June) Implementing Management Practices Reduces Nitrate in Virginia’s Muddy Creek. Accessed August 3, 2016. United States Department of Agriculture (2011) Assessment of the Effects of Conservation Practices on Cultivated Cropland in the Chesapeake Bay Region. Accessed August 3, 2016. Some Tea With Your River, Sir?